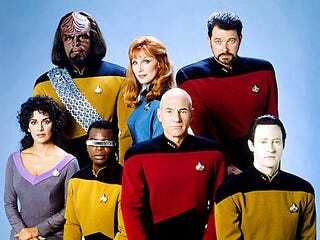 Seven years after they last shared a screen together, the entire cast of Star Trek: The Next Generation (Yes, even Wil Wheaton and Denise Crosby) are reuniting... for an episode of Fox's Family Guy. The crew of the Enterprise-D will get back together for, of all things, a Star Trek convention in next month's "Not All Dogs Go to Heaven" episode, which will see Patrick Stewart, Levar Burton, Gates McFadden, Michael Dorn, Wil Wheaton, Denise Crosby, Marina Sirtis, Brent Spiner and Jonathan Frakes appear as themselves as they get kidnapped by Stewie after he doesn't get to ask all of the questions he wanted at Quahog's Trek convention. The episode is due to air March 29th.